When a loved one comes to treatment, the frequent question from family members is “What do we do now?” Our answer: “Let us help you!” Family members are often tired, scared and sometimes very angry. 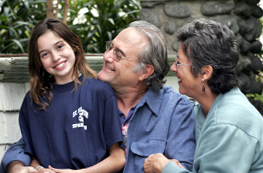 We offer support at four levels and suggest that family members take advantage of all of them. Our first group is held on Tuesday evenings for three hours. This group is designed for our residential clients and their family members. The first part of the group is educational, often with lively discussion about co-dependency, denial, family roles, etc. After the break, our family therapist leads a therapeutic group where – often for the first time in years – clients and family members communicate truthfully and effectively. Upon request, competent babysitting is available onsite during multi-family groups. A second multi-family group is offered on Saturday afternoons. This group is geared more for our outpatient clients and their family members. Occasionally family member schedules make it necessary for residential clients to attend family group on Saturday afternoons or outpatient clients to attend on Tuesday nights. At the Gooden Center, clients at any level of care (RTC, Day Treatment or IOP) can ask to schedule one or more family sessions with our licensed therapist. Clients can make these appointments in two ways: contact the therapist directly or ask the client’s assigned counselor to make the appointment. These sessions are offered at no additional cost. The Gooden Center offers monthly Family Day Intensive Workshops. These take place at our Oakland facility and are free to current clients and their families. Others can attend Family Day Intensives for $50 (adults) and $10 (children under 18). This is a six-hour family-centered day with educational workshops, a free brunch, activities and therapeutic groups. A licensed therapist leads special groups for children (ages 6 – 12). Group assistants make it possible for the children to attend age-appropriate sections with discussion, play, skits, games and art projects, all designed to give the message that addiction is a disease and no fault of the child’s. Coping skills are taught in fun ways and expression of feelings through art is encouraged as well. Children participate with parents during brunch, break, and during the last multi-family group of the day. Childcare is available on site for children under six.